Last April, WEI was named to the 2016 Tech Elite 250 list by CRN and The Channel Company. This annual list honors an exclusive group of North American IT solution providers that have earned the highest number of advanced technical certifications from leading technology vendors. We have appeared on the Tech Elite 250 list since its inception in 2011. To compile the Tech Elite 250 list, The Channel Company’s research group and CRN editors worked together to identify the most customer-beneficial technical certifications in the North American IT channel. Companies who obtained these elite designations (which enable solution providers to deliver premium products, services and customer support) were then selected from a pool of online applicants. 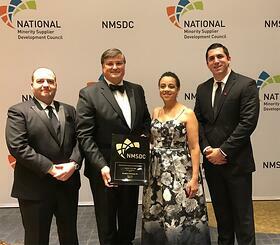 In June of last year, WEI was honored by The Greater New England Minority Supplier Development Council, GNEMSDC, as the Supplier of the Year for the fourth time, joining an elite group of minority-owned businesses in the New England area. The GNEMSDC serves to advance business opportunities for certified Asian, Black, Hispanic and Native American business enterprises and connects them to corporate members. One of the region’s leading corporate membership organizations, the GNEMSDC provides increased procurement of new client leads and business opportunities for minority businesses of all sizes by certifying companies on behalf of corporate members, aiding in the development of diversity programs, connecting through signature networking events and advocating on behalf of each minority member. We were nominated by CVS Health, who previously honored us with their 2015 Innovator of the Year award. 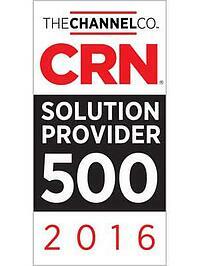 In August, CRN, a brand of The Channel Company, named us to its 2016 Solution Provider 500 (SP500) list. We were ranked at #93. This annual list honors an exclusive group of North American IT solution providers; WEI was recognized among the largest technology integrators, solution providers and IT consultants in North America by revenue. The SP500 is CRN’s predominant channel partner award list, serving as the industry standard for recognition of the most successful solution provider companies in the channel since 1995. CRN also released its 2016 SP500 Newcomers list, recognizing 47 companies making their debut in the SP500 ranking this year. In September, we were pleased to learn that for the third time, WEI was named to The Channel Company’s 2016 CRN Fast Growth 150 list. The list is CRN’s annual ranking of North America-based technology integrators, solution providers and IT consultants with gross sales of at least $1 million who have experienced significant economic growth over the past two years. The 2016 list was based on gains in gross revenue between 2013 and 2015, and the companies recognized represent a total combined revenue of more than $25,637,241,944. Included for the third year in a row on Business NH Magazine’s prestigious list of family owned companies by revenue, WEI ranked #2 on the list of Top Family Owned Businesses, up from #7 in both 2014 and 2015. We were honored to be distinguished among 157 other companies on the list, and it was an impressive accomplishment to be ranked #2. WEI was also 9th on the list for average annual revenue growth between 2013 and 2015. Having been a top preforming HPE partner for more than 25 years, we were thrilled to learn we received the 2016 HPE US Partner of the Year award for VAR percentage growth by Hewlett Packard Enterprise (HPE). This is the second time WEI was honored with this distinction, and both times the honor was based on percentage growth. HPE’s 2016 Partner of the Year awards recognize partners across all of their business groups, including the Enterprise Group, Software, HPE Financial Services and Alliances. 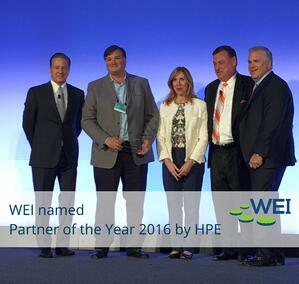 A longtime collaborator with WEI, HPE honored 61 companies for their outstanding performance and accomplishments; the distinction showcases WEI’s commitment to its clients, customers and partners, all of which were integral to their continued growth and success throughout the years. The National Minority Supplier Development Council (NMSDC) named WEI as Class IV 2016 Supplier of the Year, allowing us to join an e lite group of minority-owned businesses nationwide that are making technological leaps and bounds. 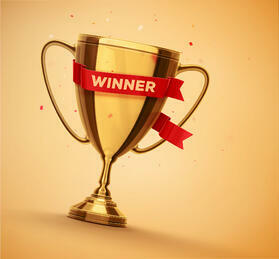 We were nominated by Blue Cross Blue Shield of Massachusetts. Business NH Magazine sees signs of hope in tough economic times among the ranked companies for their Top 20 Fastest Growing Companies list. WEI was ranked as #6. We continually strive to serve clients with the best customer service and most advanced options available. By becoming a trusted advisor and technology partner for their customers, we were able to identify goals of the business, challenges they may face and ultimate objectives. Our advisors then create customized IT solutions to help partners succeed. From all of us at WEI, thank you to the companies who not only acknowledged us, but also nominated us for these recognitions. We appreciate the trust you have put in our company and look forward to many more successful years to come!